It was supposed to be simple: break in to the department store, steal the top secret documents, and get out. But someone gassed you, and now you're alone on the store's roof, and things are bound to get more complex before they get simpler. So begins Japanese developer Gatamari's newest escaper, Mission in Department Store. Click the green and red arrows to navigate, and click on various objects to zoom in on them, interact, or pick them up. Once something is in your inventory, click it to highlight it for use, and if you want to take a closer look at it or combine it with something else, that's what the "About Item" button is for. Your ultimate goal is to nab the top secret file and leave the department store... and maybe do a few things more, if you're interested in getting the better of the game's two endings. You may recognize this developer from a past Weekday Escape. There's no way around it, Gatamari is an expert at this trade. The graphics are the antithesis of the fancy photorealism that developers like Robamimi or Tesshi-e might be fond of, but it's never difficult to tell what you're looking at. The puzzles are logical and cleverly designed. Although there's no changing cursor, you never have to click anywhere unintuitive, although some clickable areas are difficult to find if you're not really looking for them. The game may be in Japanese, but the language barrier is non-obstructive when it comes to gameplay, and the important things are in English. There's even the option to adjust how quickly the elevators move and how fast the doors open and close, in case the tediousness drives you crazy. It's hard to find fault with Mission in Department store, especially if you're looking for an elaborate, enjoyable escape game to kill some time. Mission in Department Store Walkthrough now available! You start on the rooftop. There are three views of the city around you, but nothing to see in any of them, so turn to face the elevator doors. Some joker wrote "TOILET" next to the elevator. Weird... maybe it's a hint for something. We'll tackle that later. Call the elevator and step inside. The department store has eleven floors, including the basement and rooftop. Inside this elevator you see a list of them all. Let's look at them from top to bottom. Floor 9 is the office. It's locked with a keycard. Floor 8 is the restaurant. The display with pasta and a fork is locked with a four-digit code. Floor 7 is the interior department. There's a drawer marked "JUNK"; it's jammed and won't open. Floor 6 is the "erectric" (silly Japanese and their R's) department. There's a strange panel with four blue circle quadrants, and apparently the hint for it is on floor 1. Floor 5 is the toy department. You can see a toy car on a ramp course in there. Floor 4 is the book department. There's a stack of books, and you can look at the top one: "yellow car - red car = 8F pass". Odd. Floor 3 is the mens' department. Examine the mannequin and take one of its socks. Floor 2 is the ladies' department. The door has a red arrow and some squares on it. Floor 1 is the amusement (?) department. There's a dispenser there, but you don't have a coin for it. Lastly, there's the basement parking garage. The exit's down here, but it requires a keycard, too. There's also a locked panel and two cars to the left, and something in the blue car to the right. You may have also noticed two other elevators besides the one you first took. The left elevator goes to every floor but the rooftop, and has a wobbly picture of two women and a vase inside it. The right elevator is out of order. Enough window shopping, we've got some puzzles to solve! There's no restroom in this department store, so what could the word "TOILET" possibly refer to? Perhaps it's a code for something. That panel in the parking garage was locked with a six-digit code, but we'd need to translate the letters into numbers somehow. The floor guide in the center elevator might serve another purpose. T-O-I-L-E-T... Toy, Office, Interior, Ladies, Erectric, Toy perhaps? That would make the code 5-9-7-2-6-5. Try that on the panel in the parking garage and it opens! It's a fusebox! For some reason the 2 switch is off, so turn it back on. Also, take the diagram on the door's inside; you'll figure out what it means later. Maybe turning that switch on changed something on Floor 2. Go back there and investigate. It's lit up inside the ladies' department now. And those red squares look like they're highlighting different parts of the ladies' faces. Now where could we use that sequence? How about the wobbly picture in the left elevator? Jiggle it in the appropriate order: upper left, lower right, upper right, upper left, lower left, lower right, upper right. We know the hint for the panel on Floor 6 is on Floor 1 somewhere. Let's go investigate. Hm... what looks like that? ...a pair of batteries? Well, you DO have a use for them. Put them in the RC car remote. Now we just have to find an RC car. Go to Floor 5. Use the RC car remote, with batteries, on the door to make the RC car go. After a cutscene, it'll crash into the door. Now... what was the point of that? Remember the clue from the book? "Yellow car - red car = 8F pass". Recheck the parking garage; there's a blue car, a white car, and a yellow car there. The yellow car's license number is 6274; subtract 1845 from that and you're left with 4429. That's the code for the box on floor 8. Open it and get a fork. A fork? What do we do with it? Did you notice a crank wheel when facing the elevators on the basement floor? It opens the door to the right elevator. Go inside. The elevator's back wall is blank, but if you stare at it for a moment, you'll notice something sparkling. Look down; there's a coin lost in a gap. Use your fork to retrieve a coin. Maybe we can spend it somewhere. Before leaving the elevator, check its buttons. Only the open and close door buttons can be pressed, and why does it have an OK button? We'll worry about that later; on to business. Go to Floor 1 and use the coin on the dispenser. You'll get... a whole bunch of marbles. Dispenser must be broken. Well, we can probably do something with them. Put the marbles in the sock (the one you got from the mannequin on the men's floor, remember?) to make a... sock with marbles in it. Well, it'll probably be useful as a bludgeon. Go to the basement again. Remember the blue car? Use your new sock with marbles to break the windshield. You'll get an office keycard for your vandalism. Inside, take the pry bar from the corner of the room, then examine the PC. "****" isn't the code like the hint suggested, but did you notice how the keys were rearranged every time you pressed the * key? The * key lands in the 2 key's position first, then 6, then 7, then 3. Thus, the combination is 2673. Now... what's there to see? Mail? No mail. Text? Blank. That just leaves the "0001" folder. It's a diagram of the elevators... looks like the "BOX" is in the out-of-order elevator's shaft on Floor 4. The word "PASS" refers to that elevator, too... it's a bunch of triangles? Wait a minute. Remember how only the open and close buttons worked in that elevator? Separate those triangles into pairs and they'll look familiar: close, open, open, close, close, open. Go to the basement floor again, enter the out-of-order elevator, and press the open and close buttons in that order. Then press OK. The elevator will then work... too bad the doors won't open on any but the basement floor. Remember the jammed drawer on floor 7? Use the pry bar to get it open and nab the wrench within. Now you need some bolts to undo. If you were observant, you may have noticed a bolted-shut panel by the right elevator on Floor 4. Remove it with the wrench, then turn the familiar-looking crank handle beyond to work the elevator doors open. You can see the box... but you're not going to be able to reach it across an open elevator shaft! If only you had something to stand on... say, that elevator is running now, isn't it? Get the right elevator to Floor 3 without you in it. There are two ways to do this. One: get in, make sure the doors are open, press the 3 button, and get out before the doors close. 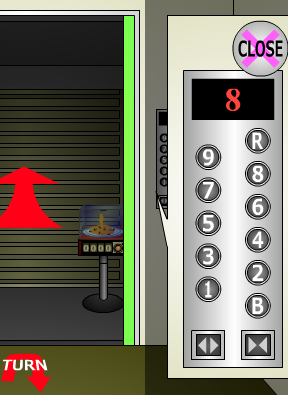 Two: take another elevator to Floor 3 and press the right elevator's call button. Once the right elevator is at Floor 3, you can go to Floor 4 and stand on it to reach the box. Now... what's the code? Remember that diagram you picked up from the fusebox? The rectangles' positions match up. The trick is to set the numbers so their "endpoints" match those of the red lines. For example, the upper-left digit has endpoints at the upper right and lower left, so it has to be the digit 5. Eventually, you'll be able to figure out the combination: 541 in the top row, 23 in the bottom row. Take the top secret file, open it, and get the parking keycard. Go to the basement level and use the parking keycard on the panel, then press "OPEN" to clear your escape route. Did you notice the envelope icon that flashed on the parking garage panel when you opened the door? The office computer had an E-mail program... maybe there's a connection. There are men on the roofs, signaling to you with lights of different colors! Look left and right to see them all: six green flashes, eight purple, and five cyan. Have you seen those colors somewhere before? When the last elevator is in place, everything will flash red for a moment. Get out and look at the elevators; floor 7 is now highlighted in red for some reason. Might as well investigate; maybe there's something there. There IS something there: a gun! Take it; that's your Happy Coin. Now you can go to the basement level and leave, and you'll get the better ending. I recommend it; it's hilarious. for a while now but am not sure what to use it for nor can I make sense of the other clues. A little pointer to get me going would be much appreciated! ...the "TOILET" clue and the panel on the 6th floor. Gah! How did I miss that?! Thanks, SL! Apparently there is more than one ending. I got the Loop End, but I think I performed certain steps toward another end. But the inability to just start near the end means I won't bother trying to get another ending. Suit yourself, Jamilworm... but keep in mind there IS a save feature. I'll have a walkthrough up later today. I'm doing one of the other ends and I just got a gun in my inventory. I'm so confused right now. That gun is exactly what you need to trigger the other ending. Just leave. T-O-I-L-E-T. Have you seen those letters anywhere? Do they stand for something? Well I managed to solve a few things and now I'm stuck. a sock, some kind of circuit diagram, and a remote controller with the batteries put in. from the book, but so far I've only seen the yellow car in the basement and no red cars. Any nudges on what I should be doing next? That controller looks like it should go to a toy vehicle. Where do you suppose you'd find a toy vehicle? Thanks, SonicLover! I figured it was something like that I just wasn't clicking where it wanted me to. That was tedious. And for me the pink elevator had to be in a different place than the Walkthrough said. In other news: Today I saw the reflection of an EXIT sign and my mind turned it into the three digit code 193... I've been playing too many escape games. I don't understand why when I've got all 3 lifts on the correct floors why the red 7 isn't happening? What floor am I supposed to be on for that? Tenzhi and Google Account URL, I can't replicate your problems. I just redid that puzzle and it worked exactly as the walkthrough states. elevator code. i'm supposed to make the floors go to floor 8 (left), floor 6 (middle), then floor 5 (right). It took a tad bit of work but i got it. But it says there's supposed to be a 7 highlighted in red and there is none. did i do something wrong? Huh. I never had that problem. Everything should flash red for a moment when the last elevator lands in place. Did you actually count the flashes of different colors from the rooftop, or did you just follow the walkthrough's numbers? well it did say to do it in that order. Maybe the colors randomize between elevators. i don't know. turns out the floor numbers are random. i assumed that because it said "8 6 and 5" that was always the numbers. I know now. Sorry about that. the left elevator needs to be on floor 3, not 8. Did for me anyway. Well, that combination has always been the same for me... maybe it depends on your IP address or something.